The Forties Field in the UKCS is a well-known example of a mature North Sea field being kept going by innovative petro-technical folk, working in multi-disciplinary teams, deploying “Know How” and armed with the right technologies. Source: Apache Corporation. As global exploration gets more difficult, there is a major prize to be gained by increasing flow rates and improving recovery factors in existing fields. In any petroleum province which is very mature in exploration terms, such as the North Sea, it would be better for companies to stop ‘wildcat’ exploring and focus on enhancing production in and around existing oil & gas fields. 'Listening' to the reservoir: a fibre optic cable (depicted as the thin black line, delivered through tubing) records the sound of gas and water production from completion zones 9 and 7 in a 'tight' reservoir. Source: FoTech Solutions When production from Forties commenced in 1975, it was predicted that the field would stop producing by the early 1990s. In 1990, it was expected to be shut down by the year 2000. Yet now, over forty years since it was first discovered, the Forties Field is still producing, and the recoverable reserves have increased by 35% since the start of production, even though the area of the field as defined by the oil-water contact has remained approximately the same (see GEO ExPro Vol. 7, No.3). Plateau production of 500,000 bopd was reached in 1978, lasting until 1981, and progressively declining to 77,000 bopd in 1999. At this point the field had already produced 2.5 billion barrels and still had nearly 60 producing wells. 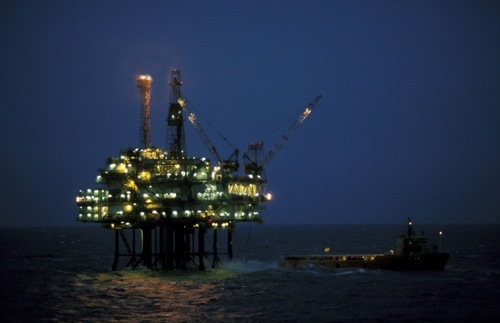 With production down to 35,000 bopd, BP sold the Forties field in 2003. It had been such an iconic field for UK North Sea exploration that some commentators likened this to ‘selling off the family silver’. The purchaser, Apache Corporation, initiated an intensive re-evaluation of the field and found a further 800 MMbo. By undertaking various efficiency measures and installing new equipment, it has brought new life to the field which is now producing 70,000 bopd and is expected to be still pumping oil for the next twenty years. Forties is not alone in benefitting from an integrated approach to improved recovery; the Statfjord Field in the NOCS is a similar example, with its recovery factor now headed towards 70%. 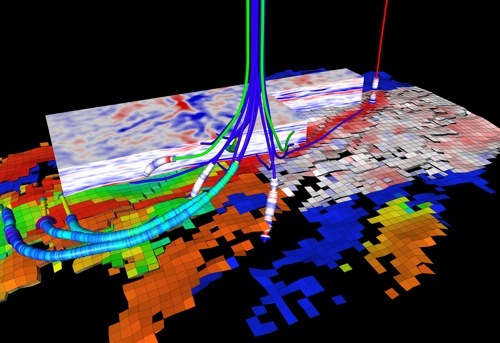 Integration of sub-surface data and interpretations with drilling in a Collaborative Working Environment. (Images published with permission of the owner: CoViz) Broadly speaking, we can divide the technologies that can help other fields be similarly transformed into those to do with the reservoir and wells, and those to do with the top-sides. 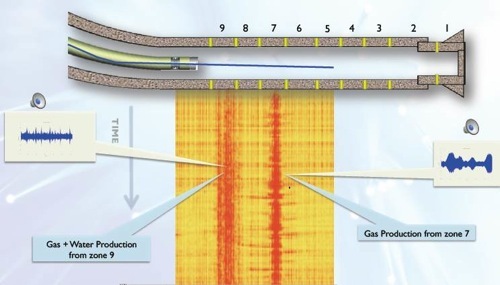 - recognising where there are reserves of undeveloped or unswept hydrocarbons - key technologies are reservoir monitoring (using 4D seismic/permanent seismic monitoring), production monitoring, reservoir simulation, history matching. - mobilising these reserves towards the well bores - key technologies include fraccing, enhanced recovery (EOR) mechanisms (Microbial, WAG, CO2 floods etc). - moving these mobile hydrocarbons into and along the well bores - completion, pumping and flow monitoring technologies are key. The broad ‘top-sides’ themes include improving operational efficiency (such as 'debottle-necking'), monitoring and improving operational integrity, safety and cost reduction. The ‘Digital Oil Field’ then provides an enabling framework in which these key technologies can be deployed for optimal efficiency and effectiveness - key aspects include automation and collaborative working environments. Especially offshore, delivering both production performance and recovery factor improvements requires an integrated field development plan: it is not a matter of simply introducing a single technology. A downhole ‘robot’, a Well Tractor, is able to reach the toe of a deviated or horizontal well and carry out operations throughout the entire length of the wellbore. Source: Welltec a/s. How big is the prize to be gained by increasing recovery factors? Sandrea and Sandrea estimate the global recovery factor, (the percentage of the total conventional oil volume likely to be produced in the world's oil fields), to be 22% of the oil in place. Using a value of 2,158 Bbo for the ultimate recoverable volume and a 22% recovery factor, the estimate global STOIIP is 9,800 Bbo. This 22% global recovery factor compares to previously published estimates in the range of 27% to 35%, which were probably over-optimistic. Typical recovery factors vary world-wide. Average recovery rates for the North Sea are stated to be about 45%, the highest in the world, compared with 39% for the USA and 23% for Saudi Arabia. Examples of individual fields with high recovery factors are Statfjord (North Sea) and Prudhoe Bay (Alaska) with 66% and more than 47% respectively. Turning to Enhanced Oil Recovery in particular, Awan et al. have surveyed all North Sea EOR projects initiated in the 30 years 1975 to 2005, and have also reviewed all microbial EOR projects undertaken world-wide. Approximately 63% of the North Sea projects were on the Norwegian Continental Shelf (NCS), 32% in the UKCS, the rest in Danish waters: Statoil has been the leader in conducting EOR field operations in the North Sea. Awan et al. conclude that microbial processes, CO2 injection and water-alternating-gas (WAG) injection are the most relevant technologies. Moving the current recovery factor for the NCS of approximately 45% to the 50% target (for oil; the target is 75% for gas) established by the Norwegian Ministry of Petroleum and Energy would yield approximately an additional 4 billion barrels of oil. A 22% recovery factor means that 78% of the world's oil will be left behind once all the oil fields are shut in and abandoned, and only 3% of the world's oil is currently produced as a result of Enhanced Oil Recovery (EOR) technologies. Yet experience with one EOR method - the injection of CO2 - in the USA and elsewhere, shows that this can result in increases in recovery of between 7 and 15% following initial recoveries using water-flooding. Hence, by comparing the UKCS with West Texas, Gluyas has estimated that an additional 2.7 to 8 billion barrels of technical reserves could result in the UKCS from CO2 injection, corresponding to an increase of recovery factor in the range of 4 to 12%. Provided the CO2 supply can be found, the US Department of Energy has estimated a minimum of 30 billion barrels is recoverable with CO2 EOR in the USA. It should be emphasised that increasing recovery factors depends on a range of technologies – surveillance, ‘smart’ wells, EOR etc. Nevertheless, worldwide, just a 1% increase in the global recovery factor represents almost 90 Bbo, equivalent to replacing roughly 3 years of production at current levels. Wherever serious studies have been undertaken, truly astonishing volumes of oil can be contemplated from increasing recovery factors using technologies that are known today. Oil and gas companies can of course choose from many investment options, economically distinguishable from one another by their net margin per barrel (or per Mcf) at some ‘benchmark’ price, for example $70/barrel. The available options include service contracts in Iraq; EOR projects on existing fields; improved primary/secondary recovery projects in existing fields; ‘full cycle’ deep water projects (from exploration through to production); and ‘full cycle’ Shale Oil (for example onshore USA). Certainly, it seems reasonable to believe that the current approximately 10% of all existing discovery volumes that has actually made it to production is very much a lower limit. In many instances, a rising oil price will ensure that primary, secondary and tertiary recovery projects are economic, although in some instances it may be necessary for governments to give tax incentives to help improved recovery projects - for example those based on CO2 EOR - to bring them into existence. However, for major economic players such as the USA and western Europe, such support would have the significant political advantage of reducing both dependence on imported oil and the outwards flow of funds. Finally, it will be noticed that all of the technologies that have been illustrated in this short review are from relatively small, entrepreneurial, companies, as a matter of fact all of them supported by some form of private equity. “Breakthroughs” to higher recovery factors depend on the contribution of such ventures. Ocean bottom seismic (OBS) produces superior seismic images compared to those from conventional 3D streamer seismic. OBS acquisition offers the prospect of full illumination and high multiplicity of signals from the same subsurface points (high data fold). C.F. Chai, F.G. Van Den Berg, P. Engbers; Shell Global Solutions International B.V. The implementation of Smart Fields solutions has enabled Shell to increase production, reduce deferment, and improve ultimate recovery while reducing costs and HSSE exposure.